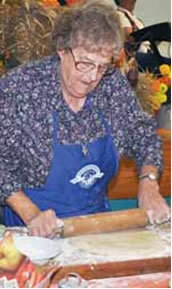 The First AppleFest was inaugurated in 1978 as a fund raiser to help meet the society’s financial needs. An Apple Queen was crowned and there were games for children, craft items, home baked goods, cider and apples. Hosting the event was "Johnny Appleseed" and old-time fiddle music was played. Now the celebration is held at the Nobleboro Central School and the Historical Center. Apples, of course, are the stars of the day. Always a favorite, this festival combines the beauty of autumn with crafts, live music and friends. Held early in October, AppleFest has been celebrating beautiful crafts, great music and wonderful food for years. 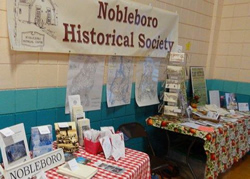 Sponsored by the Nobleboro Historical Society, the festival has something for everyone. It is one of those laid-back and family friendly events that remind folks of the timelessness of such gatherings. High tech has no place there, and not a cell phone is in sight. That alone makes the day a refreshing change for visitors. Highlighting the festivities is live bluegrass music for toe tapping, listenin' and dancing. Apples from Beth's Farm, and over 100 silent auction items. Kieve-Wavus activities for kids include face painting and games, the NCS eighth grade class has a food table, along with tables for local businesses and nonprofits. At the Historical Center, Al O’Donnell & Roger Hathaway, with reenactor Tom Backus, will display guns used in the "Guns that Went West" and talk about them. Cold cider & hot mulled apple cider, coffee, and tea served with fresh local honey. Join us for lunch with home-made turkey salad sandwiches, and a piece of pie – or take a whole apple pie home with you. Bid at the Silent Auction for items like salon gift certificates, fudge, apple themed items, gift certificates, and many other fun & valuable things provided by our local community. Drawings for free door prizes throughout the day. Bring the family and sit awhile to listen to the music and chat with your neighbors! 10 weeks and 3 days away!